Obesity has been the forward march of technology. Our ability to invent new ways to make life easier moves much faster than our bodies can adapt, so we are left with Stone-Age programming in an advanced world. We don’t have to work as hard to feed ourselves each day as our ancestors did, and spending almost an entire day seated at a desk or on a couch is completely normal for much of the developed world. This has been a consistent theme of Personalized Fitness & Nutrition Coaching—understanding how our programming differs from the world around us so that we can find ways to reintroduce healthy behaviors into our lives—but technology is not all bad. As much as I wish that we would all spend less time in front of our screens, there is no denying that the phones we keep within arm’s reach have a lot of potential for good. Filter out blue light. 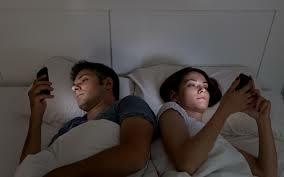 We have known for some time that the light emitted from our screens disrupts our circadian rhythms, making it difficult for us to fall asleep at night. While you should still honor a digital sunset (turning your phone off at least an hour before bed), you could also benefit from downloading an app that filters out the intensity of blue light, transitioning your phone to a much less jarring red-hue as you wind-down for sleep. Use reminders to reinforce habits. Whether you use a high-powered task app or simply take advantage of your phone’s alarm function, setting reminders for even fundamental habits like your regular meals or stopping to meditate/pray can help to pull you out of the momentum of your day. When you are caught up in the rush of daily life, a simple alert can go a long way. Tools like Apple Health are powerful data collectors, and many people enjoy the novelty of seeing their own health data pile up, but that novelty often wears off. Health apps today do not have the behavior and community support that we know—from research and years in the field—is necessary for creating lasting change. That does not mean you can’t have fun with health apps, just don’t expect them to be silver bullets..